• More copies, more locations. 20,000 summer copies FREE at nearly 800 newsstands: restaurants, gift shops, motels, galleries, the Maine Tourism Association, Portland Jetport, Amtrak Downeaster, and many more. • Unique local stories and brilliant photos. Each and every edition has brand new feature-length local story content, and lively, colorful photos. • Web exposure through WestCoastMaine.com. Test drive the latest web edition, plus read back issues online today! • QuickMark shortcut. Takes mobile users directly to our E-zine, and your hotlinked ad. • Social media. We share western Maine news, call out our advertisers, and update readers on the very latest happenings. • Wicked Good Events Calendar. By far, the biggest and best list of adventures in Western Maine. • Affordable advertising rates. Plus, we can help you design your full color ad – for free. Our popularity with a wide variety of readers, both year-round residents and visitors to the region, continues to grow. 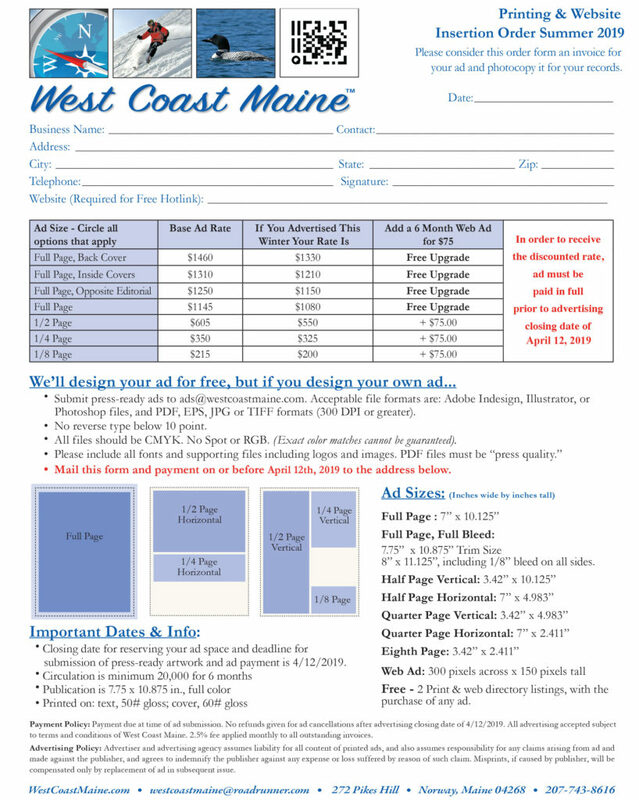 Click on the image below to download the advertising insertion order form.